Toby Caplan-Stonefield became a member of the Los Angeles Philharmonic at the age of twenty, and has played under the direction of more than thirty of the world’s greatest conductors. Since that time, she has been in the Hollywood Bowl Symphony Orchestra, Ojai Festival Arts Orchestra, Glendale Symphony, Monday Evening Concerts Series, Ensembles for the Los Angeles County Museum of Art, The Greek Theatre Ballet Orchestra, and principal flute for the Los Angeles Civic Light Opera. Toby has performed music for the film industry at Universal, Disney, and Paramount Studios, and was principal flutist for MGM’s production of “Dr. Zhivago”. 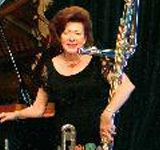 She has performed many solo recitals throughout the Southern California area, performed as soloist with orchestras, premiered works written especially for her, and performed twice as soloist for the National Flute Association Convention. Her recently released CD “Music for your Enjoyment” from Hollywood, Paris and a little Brazil featuring Flute and Guitar; as well as “The Spiritual Flute” Vol. 1, featuring Music by Jewish Composers, and others with Spiritual Qualities; and her two volume CD “Music for the Millennium” – (Vol 1 - 20th Century Favorites for Flute and Piano), (Vol 2 – Varied Selections for Flute and Harp) are available at www.FluteWorld.com and http://www.cdbaby.com.